Swauger Slough (also known as Kids Creek) runs through this 4+ acre oasis right in the heart of Mackay. 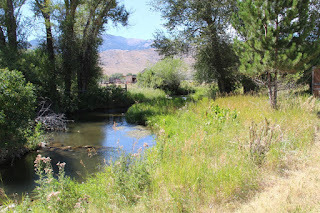 A great place to relax, fish, recreate and enjoy the beautiful views of the mountains that surround this property. The White Know Mountains to the west and Mount McCaleb to the east are spectacular. Plenty of room to build a dream home with outbuildings already on the the property. A 1,296 square foot 4 car garage with heat on one side, a 220 hook-up for electricity and cabinets and countertops is ideal to tinker in or base a home business from. A rustic barn has 672 square feet with exposed rafters, electricity, tall ceilings, and a concrete floor make it a perfect place to store your taller trailers or small rv. This property also comes with water rights. Live in the single wide trailer that is already on the property and connected to city water and sewer while you build the house of your dreams. Very close to numerous recreational activities. Come boat, hike, ride, ATV, fish and hunt the surrounding area. Sheep Mountain, Mackay Reservoir, Sawtooth National Forest and the Salmon-Challis National Forest are all just a drive away. Please contact Maleah Ivie at: 208-339-2715, to see this picturesque property!